Young being interviewed in April 2010. Christopher Alan "Chris" Young (born June 12, 1985) is an American country music singer and songwriter. In 2006, he was declared the winner of the television program Nashville Star, a singing competition which aired on the USA Network. After winning, he was signed to RCA Records Nashville, releasing his self-titled debut album that same year. It produced two singles on Hot Country Songs with "Drinkin' Me Lonely" and "You're Gonna Love Me". His second album, The Man I Want to Be, was released September 1, 2009. It included the singles "Voices", "Gettin' You Home (The Black Dress Song)", and the title track, all of which went to number 1. Young's third album, Neon, produced two more number ones in "Tomorrow" and "You" in 2011 as well as the top 20 hit "I Can Take It from There" in 2012. The follow-up, 2013's A.M., produced three new singles with the top 5 hits "Aw Naw", "Who I Am with You", and "Lonely Eyes". His fifth album, I'm Comin' Over, was released on November 13, 2015. Chris Young was born in Murfreesboro, Tennessee, on June 12, 1985. While growing up he attended Trinity United Methodist church. His grandfather, Richard Yates, was a performer on the Louisiana Hayride. He showed interest in music from an early age, performing in various children's theater productions; while attending Oakland High School (Tennessee), he sang in his high school choir and began playing in local clubs. In 2000, he performed with his high school's Winter Drumline in a performance entitled "A Night at the Palladium", where he was a mariachi singer. The group performed in the Winter Guard International Tournament in Ohio that year. While attending college, he continued to tour, performing more than 150 shows a year. During a gig in Arlington, Texas, he was encouraged by Park Scott and Keith Swan to try out for the Nashville Star, a television talent show on the USA Networks. Auditioning in Houston, Texas, he entered the show and won in 2006. His win earned him a contract with RCA Records Nashville and late that year, he released his debut single "Drinkin' Me Lonely". It peaked at number 42 on the Billboard Hot Country Songs chart and served as the first single to his self-titled debut album, which was produced by Buddy Cannon. The album's second single, "You're Gonna Love Me", peaked at number 48. In May 2008, Young released his third single, "Voices". At the CMA Music Festival in June, he promoted the single by e-mailing it to visitors at his Music Fest booth. In August, "Voices" became his first Top 40 entry on the Billboard charts, peaking at 37. His second album, The Man I Want to Be, was released in September 2009. It was produced by James Stroud and includes cover versions of Waylon Jennings' "Rose in Paradise" (as a duet with Willie Nelson) and Tony Joe White's "Rainy Night in Georgia". In October 2009 Young's fourth chart single, "Gettin' You Home (The Black Dress Song)", became his first number 1 single. The album's title track was released in November 2009. Both it and a re-release of "Voices" went to number 1. He was nominated for the 2010 Academy of Country Music Top New Solo Vocalist, alongside Luke Bryan and Jamey Johnson. He presented at the 44th Annual Country Music Awards on November 10, 2010. He was nominated for a Grammy Award for Best Male Country Vocal Performance for "Gettin' You Home". Young released the single "Tomorrow" in February 2011. It became his fourth straight number 1. The album Neon was released in July 2011. The album includes his fifth consecutive number 1, "You", the title track, and "I Can Take It from There". In August 2012, "Tomorrow" became his first platinum selling single. In 2013, Young served as an Ambassador for the CMA Songwriter's Series showcased in Belfast, Dublin, London, and Paris as an attempt to get country music in the media overseas. The first single from Young's fourth studio album, "Aw Naw", was released to country radio on May 13, 2013. It peaked at number 3 on the Country Airplay chart in November 2013. The album, A.M., was released on September 17, 2013. The album's second single, "Who I Am with You", was released on January 20, 2014. It peaked at number 2 on the Country Airplay chart in August 2014. The album's third single, "Lonely Eyes", was released to country radio on August 25, 2014. It reached number 2 on the Country Airplay chart in April 2015. On May 12, 2015, Young released a new single titled "I'm Comin' Over". It is the lead single from his fifth studio album, also called I'm Comin' Over, which was released on November 13, 2015. The same month, "I'm Comin' Over" became Young's sixth Number One single on the Country Airplay chart, and his first since "You" in February 2012. Young will play the 14-show I'm Comin' Over Tour in late 2016 in support of the album. The album's second single, "Think of You" released to country radio on January 4, 2016. It reached at number one on the Country Airplay chart in May 2016. The album's third single, "Sober Saturday Night" released to country radio on June 6, 2016. On August 13, 2013, Young was en route to a tour date in Montana when he began to go into septic shock stemming from a bacterial infection as a result of a small cut in his leg. He was taken by ambulance to a Denver, Colorado, hospital. The medical team responded quickly and immediately started Young on medications to keep the infection from spreading. In addition, an emergency surgery was scheduled for shortly after midnight on August 14 during which the infection in Young's leg was treated. Young returned home under his physician's care. As expected, his mobility was impacted by the surgery and his doctor requested he wait a full week post-surgery to resume touring. Young resumed touring on August 22. In June 2014, Young canceled a performance at the CMA Music Festival after accidentally cutting his left hand with a kitchen knife. The cut required surgery to reconnect tendons in that hand. Young has shown support for Little Kids Rock by donating various items to the organization for auction, raising money to put instruments in the hands of children. He has also been a major supporter for Stars For Stripes. In 2012 he made a promise to raise funds for Stars for Stripes and came through for them by closing out his campaign raising $35,000. He also is known for his support for St. Jude Children's Hospital  and has raised money for them by sponsoring a tree at the Gaylord Opryland Resort's Annual Hall of Trees  On September 8, 2014 Young donated $25,000 of his own money, along with $5,000 from his fanclub, to the Nashville School of Arts. ↑ Full name per BMI database. ↑ "Today in history". ABC News. Associated Press. June 12, 2014. 1 2 3 4 Leggett, Steve. Biography for Chris Young at AllMusic Retrieved 2008-06-11. ↑ "Chris Young reaches fans with "Voices"". Country Standard Time. 2008-06-13. Retrieved 2008-06-28. 1 2 "Nashville Star's Chris Young Releasing New Album on Sept. 1". CMT. 2009-06-30. Retrieved 2009-08-08. ↑ Hughes, Donna (11 May 2010). "Chris Young Is the No. 1 'Man' Again". The Boot. ↑ "Country Music Awards". TVGuide.com. 2010-11-04. ↑ Archived June 4, 2013, at the Wayback Machine. ↑ Dukes, Billy (June 4, 2013). "Chris Young Creatively Reveals Name, Release Date of 2013 New Album". Taste of Country. Retrieved June 5, 2013. ↑ "Chris Young Announces Release Date for New Album 'I'm Comin' Over'". Taste of Country. September 1, 2015. Retrieved September 5, 2015. 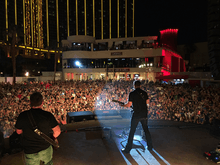 ↑ "Chris Young Reveals Another Surprise: The I'm Comin' Over Tour". Taste of Country. August 11, 2015. Retrieved September 5, 2015. ↑ "Scary Details of Chris Young's Leg Infection Revealed". Tasteofcountry.com. Retrieved 2016-01-02. ↑ "Chris Young's condition improves". Tennessean.com. 2014-06-09. Retrieved 2016-01-02. ↑ "Chris Young". Little Kids Rock. Retrieved 2016-01-02. ↑ "Country Décor, American Travel, Southern Food Recipes, Rustic Weddings | GAC". Blog.gactv.com. 2015-05-15. Retrieved 2016-01-02. ↑ "February 21st & 22nd | 96.3 KHEY Country". Khey.com. Retrieved 2016-01-02. ↑ "Chris Young Supports St. Jude Children's Research Hospital by Sponsoring a "NEON Holiday Tree" as Part of Gaylord Opryland® Resort's Fifth Annual Hall of Trees". Country Music Pride. Retrieved 2016-01-02. 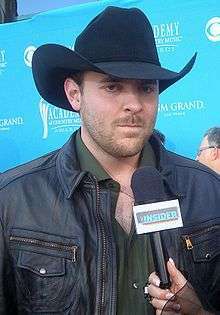 Wikimedia Commons has media related to Chris Young (singer). "I Can Take It from There"